Saint-Tropez, Saint-Tropez 83990 on the French Riviera is the international window of Provence, and Cotes de Provence wines. This is the story of a small town with a giant reputation. This is Saint-Tropez. The quaint village of Saint-Tropez, nestled against the azure blue of the Mediterranean was, up to the first part of the 20th century, a relatively unknown small port dedicated to fishing and wine production. Historically the oldest wine producing region of France, fine wines have been made in Provence for more than 2600 years, first by the Phoenicians and Greek colonists and later by Romans following their invading legions. The romans saw much interest in Saint-Tropez for its strategic position, the gulf providing a calm harbor protected from the elements ideal for sustainable commerce, and the hilly peninsula offering a unique 360° watch point away from the mainland. Over the centuries, a few families have cultivated vines from generation to generation up to this day. Saint-Tropez strategic position made it a much sought after locale. The citadel offers a panoramic view of the gulf of Saint-Tropez which created an intriguing defense position. Throughout the years saint-Tropez successfully defended itself from invaders and maintained its position as the jewel of the Riviera hidden between the sea and the rocks. Saint-Tropez has changed much in the past few hundred years. With its temperate climate and sun-drenched beaches, Saint-Tropez slowly became known as a secret “off the map get-away” where celebrities mixed with the local people. This small fishermans' village and relatively isolated paradise, in the 1950s Saint-Tropez saw the likes of Otto Preminger, Grace kely and Alfred Hitchcock. Defined by idyllic beaches and a small port, the town of Saint-Tropez had a meteoric rise to international renown with Brigette Bardot putting the village on the map in the 1960s. Most of Hollywood flocked to the shores of Saint-Tropez hoping to catch a piece of paradise and soak up the provincial sunshine. The unique microclimate of Saint-Tropez, being a peninsula surrounded by a coastal mountain called Esterel, allows for not only heavenly summers but the production of some of the best rosé in the region. The brisk winters and warm summers created the ideal environment for the production of Rosé wine. In this gem of a region Louis Angelvin created Maison Angelvin. 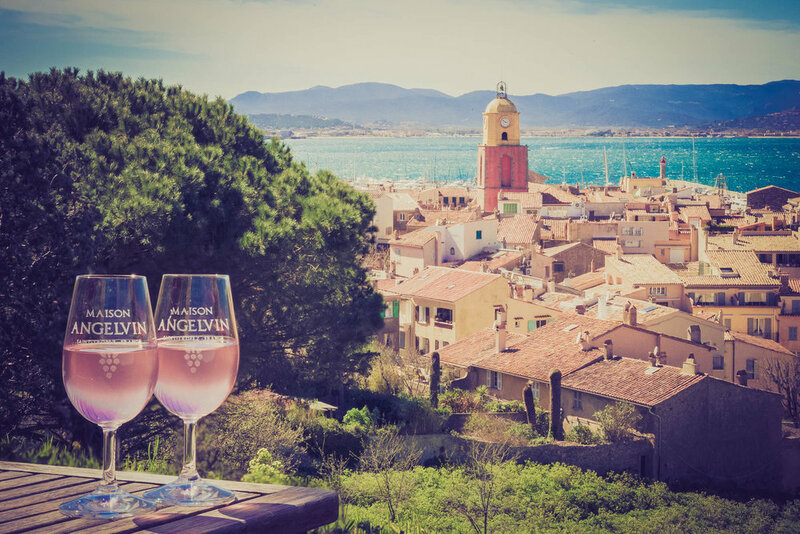 While the times have changed Maison Angelvin maintains its commitment to deliver the finest rosés and to encapsulate the timeless spirit of Saint-Tropez. Santé!